Those curious to know how Washington functions in the era of Barack Obama would benefit from reading a Dec. 17 item by Al Kamen in the Washington Post. Its 333 words pretty much sum things up. The number of possible nominees to replace outgoing Secretary of Energy Steven Chu, Kamen writes, is decreasing. And "one name seems to be popping up increasingly." That would be the name of (pop!) Tom Steyer, the San Francisco hedge fund billionaire and political activist whose financial prospects have an uncanny symmetry with the alternative energy policies of the present administration. Steyer is not famous but would be if his portfolio were designed around carbon resource extraction rather than leveraging government connections to gain market share for windmills and solar panels. He is early twenty-first century progressivism incarnate, a suave and shrewd example of how the self-regard and political entrepreneurism of the filthy rich is glossed over and excused so long as they pay the right people and squawk the designated left-wing clichés. 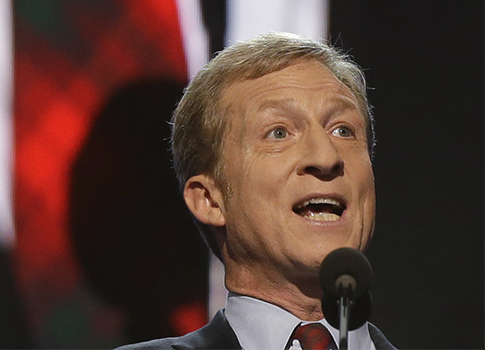 The arc of Steyer’s life bends toward aristocracy. He was born in 1957 in New York City where his lawyer father worked on Wall Street. He was educated at the Buckley School on the Upper East Side and at Phillips Exeter and at Yale. He did a tour at Morgan Stanley and another at Goldman Sachs where his boss was the future Treasury Secretary and financial deregulator Robert Rubin. His MBA is from Stanford. Steyer began to accumulate capital when he moved to San Francisco and entered the world of leveraged buyouts, private equity, and carried interest. He founded Farallon Capital Management in 1986. The firm is huge. Steyer’s net worth is estimated to be more than $1 billion. And though he seems always to have been a run-of-the-mill liberal Democrat of the coastal elite variety, in recent years he has taken to giving a large portion of that money away to political and environmental causes. As the New York Times put it in a backslapping 2011 profile, until 2010 Steyer "was just another billionaire hedge fund manager intent on keeping a low profile." You know—just one of those. Obama changed him. Steyer may have started the 2008 presidential cycle as a supporter of Hillary Clinton but like so many wealthy white Democrats he soon switched his allegiance to the freshman Senator from Illinois. He has donated hundreds of thousands of dollars to Obama’s campaigns and rounded up millions more. And he has been rewarded for his efforts: He’s enjoyed White House access, a speech at the 2012 Democratic National Convention—imagine the berserk response if David Koch had addressed the RNC—and now has within his grasp a seat in the presidential cabinet from which he would direct taxpayer dollars to companies in which he holds or has held positions. "President Obama knows that advanced energy is America’s future," Steyer told DNC delegates in Charlotte. "And my bet, as a businessman, is that he’s exactly right." The bet has paid off. The media may have neglected Steyer’s DNC speech but it was nonetheless revealing. The rhetorical trick of referring to solar and wind as "advanced" energies, when Australopithecus benefited from the sun and the first windmill seems to have been built in Roman Alexandria, is a fine irony. "Businessman" meanwhile may have been a fair description of Steyer’s occupation for most of his life but it now seems too confining. "Insider" would be better; "crony" better yet. In 2009 Steyer helped found Greener Capital, a VC firm that profits from investments in companies benefiting from the pronounced shift in energy policy under Obama and Chu. Also in 2009 Steyer’s name began to appear on the tax filings of the liberal Center for American Progress (CAP), the think tank that formulated many of Obama’s advanced energy policies. Steyer’s charitable group, TomKat, has donated more than a million dollars to CAP, and he is listed as a director on its most recent form 990. This is the same think tank remember whose founder served as the head of Obama’s transition team and that provided a desk to Steven Spinner, the Obama donor and Department of Energy official who pushed for subsidies to the solar panel manufacturer Solyndra (whom his wife’s law firm represented). This is the same think tank that coordinated policy and message with loan program officials according to emails obtained by the Washington Free Beacon. The association of Steyer and CAP has benefits. In January of this year Steyer coauthored a Wall Street Journal op-ed with John Podesta, "We Don’t Need More Foreign Oil and Gas," that supported Obama’s decision not to approve the Keystone XL pipeline from Canada and argued for extending "clean-energy programs like the Production Tax Credit" and reviving "the Manufacturing Tax Credit, which helps factories retool for the clean-tech sector." The authors failed to disclose that Steyer helps pay Podesta’s salary and that his investments would net millions if the federal government shaped public policy to his liking—millions of dollars that then would be funneled back into institutions like CAP and Democratic campaigns like Obama’s. Reporters are like Amazonian piranhas when they detect similar positive feedback loops between rich conservatives and political and policy campaigns. But of course in this case they are far more interested in promoting Steyer’s views and congratulating him for his absolutely conventional positions on taxes and the environment. A 2008 profile of Steyer marveled at his "soak-the-rich mindset," which author Adam Lashinsky said was just "one of the many ways" that the billionaire "embodies a different breed of investment professional than the Gucci loafer-wearing, Range Rover-driving, Bordeaux-inhaling traders who have made Greenwich, Conn., and Manhattan bubble over in recent years." Steyer, by contrast, is "a financial whiz with a hankering for social justice," an "athlete as well as a mathlete," a "guy’s guy who requires guests at his annual Christmas lunch to bring a poem to read." One has to wonder whether Lashinsky searched Steyer’s closets and wine racks for Gucci loafers and Bordeaux and other signs of political deviance. Is it the contention of this article that Steyer is somehow unique among the Masters of the Universe because he played on Yale’s soccer team? Has Adam Lashinsky not actually ever met another person who has worked on Wall Street? Does pretentiously requiring underlings to recite Maya Angelou over a catered turkey lunch absolve the rich and powerful from scrutiny and critique? Or is it merely the assumed possession of an insatiable "hankering for social justice" that leads credulous writers to forget that Steyer stands to gain much more money from having Obama build a clean energy economy than he would lose from a return to Clinton-era tax rates? Such naïve cheerleading masquerading as "journalism" is a disservice to the public because it shields powerful men from investigation. After Steyer poured millions into a successful 2010 campaign to uphold California’s complicated system of carbon mandates and thus benefit his firms, the New York Times asked if he was "the anti-Koch" for whom liberals long have dreamed. Yet in between quoting various clichés from one of his speeches the Times blogger never stopped to consider that Steyer is doing precisely the thing for which liberals falsely attack the Koch brothers: influencing politics for personal gain. When duly elected Rust Belt governors and legislators passed laws in Wisconsin and Ohio and Michigan to improve the business climates of their states the entire Western world searched for connections between their actions and the pocketbooks of Charles and David Koch. But when Steyer allocated $30 million for the campaign to support Proposition 39 on Election Day 2012, no one seemed to notice. Nor did many notice when the measure passed overwhelmingly and thus raised taxes on businesses incorporated outside California (i.e., businesses other than Farallon Capital Management and the alt-fuel companies in Silicon Valley) and used that money to fund $2.5 billion in … clean energy investments! How appropriate then that Steyer announced in October he would step down from his position as head of Farallon so he can focus on "giving back." As secretary of energy he would be giving taxpayer dollars back to the companies in whose future he holds lucrative stakes. He seems finally to have recognized that in America today finance capital is being displaced by political capital, and that philanthropy is a business more powerful and indeed more lucrative than running a hedge fund. He seems to have recognized that a billionaire who devotes his life to "public service" and "helping the environment" possesses the journalistic equivalent of Monopoly’s "Get of Jail Free" card. He recognized that believing in Barack Obama is a fast track to receiving gifts, and championing America’s "advanced energy economy" means never having to say you're sorry. This entry was posted in Columns and tagged Barack Obama, Center for American Progress, DNC, Financial Industry, John Podesta, Media, Obama Administration, Progressive Movement, Steven Chu, Tom Steyer. Bookmark the permalink.